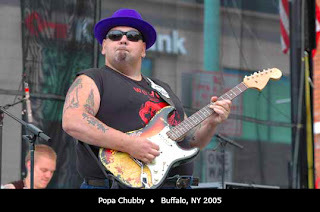 In 1975 at the age of 15, Popa Chubby went to a Johnny Winter concert opened by Hendrix tribute guitarist Randy Hansen. That was Chubby's intro. to Hendrix, and inspiration to pick up the guitar. Winter probably inspired all the tats. Popa's ample surface area permits way more ink than Johnny Winter can possibly hold. A recent article in the Seattle Post Intelligencer features some great stuff about Popa Chubby, whose recent 2 CD release "Electric Chubbyland" marks Popa's own tribute to God. I haven't heard this one yet, but the Popa Chubby I have heard shows that this guy is walking encyclopedia set of heavy classic rock riffage. He's done his homework and plays/performs with tons of feeling. Tipping the scales with tasty licks and one sweet '66 burst, Popa joins our Strat-o-Brothers line up.